FOH engineer Pete Keppler has mixed tours for music’s biggest icons, from David Bowie to ZZ Top. 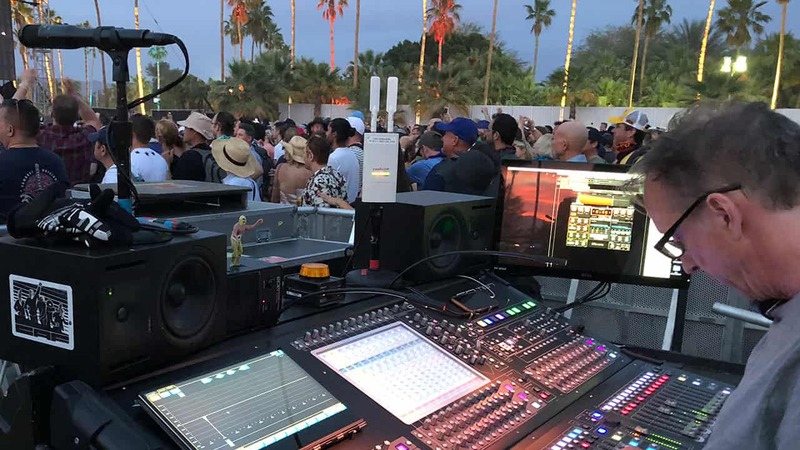 We asked him about his unconventional setup for legendary ex-Talking Heads frontman David Byrne’s live show at Coachella 2018. 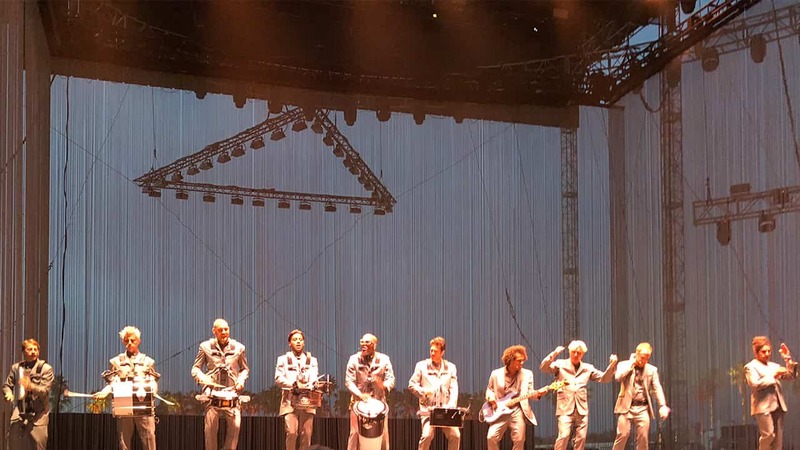 From early Talking Heads shows that saw him playing alongside as little as a tape machine or as much as a 10-piece band, to recent solo tours with an entire dance troupe onstage, David Byrne’s live concerts have rarely been ordinary. His recent American Utopia world tour, culminating at the Coachella Valley Music & Arts festival, has been no exception. We caught up with Byrne’s FOH engineer Pete Keppler to talk about his setup for the unique show and tour. Yes, and it’s quite different from what I would normally do when I’m behind the console for other artists, like Bonnie Raitt or Katy Perry. From initial prep back in August 2017 all the way through production rehearsals in February of this year, the entire American Utopia tour required a lot of rethinking from my end. The stage setup is completely open – no audio monitors, amps or other gear, just a blank floor surrounded on three sides by a 30-foot-tall aluminum chain curtain. There are twelve musicians – six of them drummers. There’s a bassist, a guitarist, a keyboard player, and David playing guitar on some songs. All of the non-drummers sing, and there are also two dedicated backing vocalists, all using headset mics. 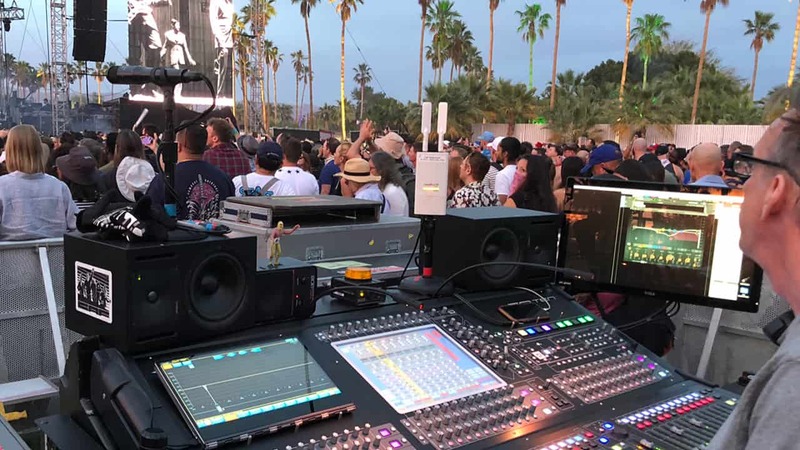 Everyone is completely wireless, including all their various instrument mics and transmitters, their IEMs, and even a BlackTrax lighting transmitter on every performer. The six drummers are wearing something akin to marching-band harnesses with quick-release systems so they can swap out different drums and percussion for various songs. All the main drums have dedicated mics and transmitters attached to them to facilitate quick changes, and we’ve also installed mics on the harnesses to cover things like hand percussion and small instruments. The show is very choreography-intensive… It’s a live performance concept completely different from any other rock show you’ve seen. I have a DiGiCo SD10 console out front, and I share head amps with John Chadwick, our monitor engineer, who’s using an SD5. We’re running roughly 48 inputs of wireless, another twenty or so wired inputs (from keyboard interfaces, guitar amp modelers, etc.) and then John runs 16 outputs of RF in-ears. It’s an RF challenge for sure, but we’re using Shure’s new Axient Digital system for the input side, and fortunately it reduces the need for bandwidth substantially. For outboard processing, I run Waves plugins via MultiRack, a Mac mini, a 20-inch touch screen, and a SoundGrid Extreme Server. With an entire stage of performers on wireless mics, how do you reduce stage noise, feedback, and proximity issues? All those issues are being amazingly well handled by the Waves F6 Dynamic EQ plugin. I'm using the six bands of the F6 to really make the most of all the gain I have available on the vocals. I’m not always a fan of permanent EQ on my sound sources, particularly vocals. On this tour I’ve developed what I call a ‘free gain’ approach to EQing. I have F6 plugin inserted via MultiRack on all the vocals. In addition to using the plugin as a more standard dynamic EQ, I set one of the bands to act as a mid and high frequency gate, in order to control spill from the drums and percussion into the vocal mics. Basically, I use this band of the F6 to turn down all the frequencies above 500-600 Hz quite significantly when the vocalist isn’t singing. I use a second channel on the SD10 to send a very filtered version of the same vocal to the external key of this band on F6, thereby opening those frequencies only when the vocalist is singing. The ‘free gain’ term (which I’m sure I’ve ‘borrowed’ from someone else!) really applies more to the effects I use on some songs, but F6 really allows me to retain and use the gain that was originally present at the mic in the first place… It only turns down the frequencies I want it to when I want it to, with the added benefit of being able to really effectively control spill, thanks to the ability to externally sidechain each band. What methods are you using to recreate the sounds and effects heard on David Byrne’s classic studio songs? I left a lot of the sounds up to our amazing band! Karl Mansfield, our keyboardist and Musical Director, has done a truly amazing job of fabricating sounds and even pulling some samples off old masters for this show. But when it comes to effects, I don’t tend to go in for replicating everything from the original recorded version of a song, as live shows tend to have their own personality and may want their own treatment. However, there are some effects that I did really want to retain from the original. Waves reverbs, delays and modulation plugins are so versatile and high-quality… They’re extremely helpful in helping me recreate that. 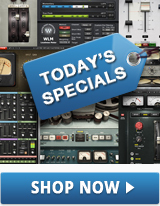 One plugin I’ve used with several artists over the last few years is the Waves/Abbey Road Reel ADT. On some songs I use it quite heavily to replicate the vocal stacking techniques used by Brian Eno on the original studio recordings by Talking Heads. On songs like “Burning Down the House” I use a lot of Reel ADT live to recreate the double-tracked vocal sound. Pete, your career spans over 35 years working front-of-house and touring with some of music’s biggest icons. What advice would you give to live sound engineers just getting their career started? My advice is to take any gig you possibly can, regardless of its status. Even if you feel you’re only partially qualified, get in there. There will be mistakes, but you will learn a lot. I’ve been doing this for 38 years, and the day that I stop learning something new, I’ll find something else to do. 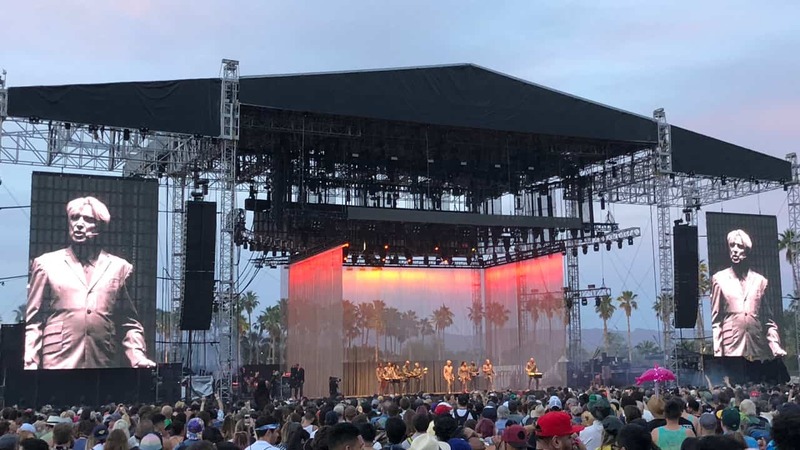 Read more about Waves at Coachella 2018.